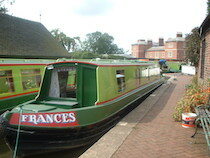 The Classic4 class canal boats. mobile phone charging point, also 12v and 240 v electric supply..
3 tea towels. Dish cloth, Brillo pad, sponge scourer, kitchen roll, initial supply of washing up liquid, a toilet roll per toilet. Floor cloth, black rubbish bag, antibacterial hand wash.